Ready mixed, cement free resinous mortar. Based on hydrated lime, and Eco-Pozzolan as well as silicate and carbonate aggregates of consistent grain size. Distinguished for its easy workability, adhesion and durability. The complete absence of cement makes it perfectly suitable for the renovation of traditional buildings, and for the restoration of degraded top coat plasters constructed with traditional material. 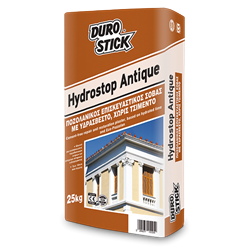 Highly recommended and uniquely appropriate for the renovation of building and monument surfaces of historical interest, wherever there are technical or aesthetical requisites. Perfectly suitable for interior and exterior plastering and restoration of traditional building surfaces that have been constructed with techniques and materials passed down through time and tradition. Materials such as Pozzolan, lime, ceramic powder etc. Apply it in thicknesses of up to 15mm per coat. Classified R: CSII, per EN 998-1.